Thirty years ago, in the first line of her 1990 book Chippendale: Behind the Factory Wall, historian Shirley Fitzgerald described the suburb as “small and unpretentious”. As Chippendale prepares to celebrate its 200th birthday in 2019, the forces of change in the inner city have left residents wondering how it will be described in the future. It certainly didn’t have a high profile in 1819, when new arrival William Chippendale and his family were granted a parcel of bushland on what was then the very edge of town. Chippendale’s boundaries extended east to Chalmers Street and in part as far south as what is now Henderson Road, Alexandria. Today Chippendale is officially bordered by the railway line, Broadway, City Road and Cleveland Street. However, what to call the southern side of Cleveland Street remains a point of discussion for the locals. “When we first moved into the area [in] the early 1970s, it was called Chippendale, and then it became Darlington,” says architect Jocelyn Jackson, who has lived on both sides of Cleveland Street. “They started to rename all the suburbs as they were originally, because it was originally Darlington.” The suburb of Darlington, however, still contained the Chippendale old post office and, later, the Chip’n’Dale takeaway shop. Chippendale’s character has undergone several transformations. Sydney’s first public housing, Strickland House, was built in Chippendale in 1914 and is still home to public housing tenants. In 1961, 33.5 per cent of Chippendale residents worked in manufacturing. By 1986 that had fallen to 8.8 per cent, and the population had shrunk from 2,458 to 1,537 in the same period. The suburb lived up to this reputation in 1981 when notorious corrupt police officer Roger Rogerson shot and killed a heroin dealer in suspicious circumstances in the aptly named Dangar Place. The incident would later be dramatised for an ABC miniseries. The site of the shooting is still marked by an “X” scratched into the gutter. “Stray dogs, stray cats – it was very much an unloved suburb,” says Jocelyn Jackson. “Chippendale was pretty much a latecomer to being accepted as a trendy place to live,” Shirley Fitzgerald agrees. Ms Fitzgerald acknowledges that the suburb has undergone huge changes even in the three decades since she wrote her book. The 2016 census recorded 8,617 people living in Chippendale, 71.4 per cent of whom rent. 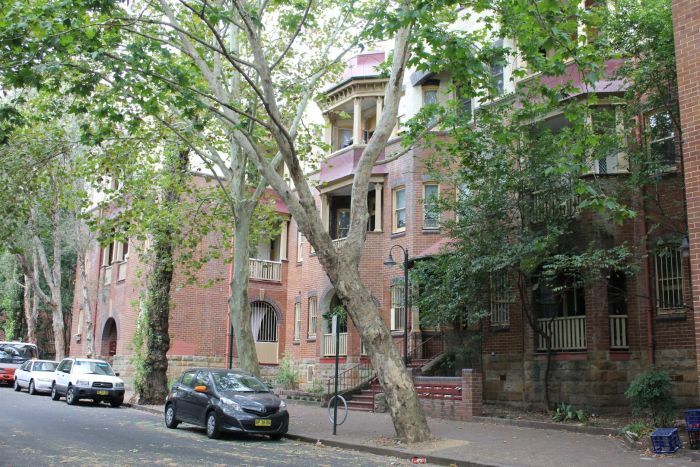 Almost half – 46.5 per cent – of Chippendale’s residents are under housing stress, that is, they spend 30 per cent or more of their income on rent. The proximity of three universities – the University of Sydney, Notre Dame and UTS – has seen an influx of students and high-density student housing. Another reason for Chippendale’s newfound desirability is the abundance of street trees, particularly in the western half of the suburb. Chippendale’s current incarnation as a trendy, built-up metropolis belies its history as a fertile farm – where Buckland Street now runs was once a creek that fed into Blackwattle Bay. Ms Fitzgerald says that, when she was researching the suburb for her book, “the real revelation was to discover the truth of the wonderful soil that exists there”. Today, Chippendale is a place of increased tension between old and new. Down the road from Strickland House, the latest building in the mammoth Central Park development is almost complete. 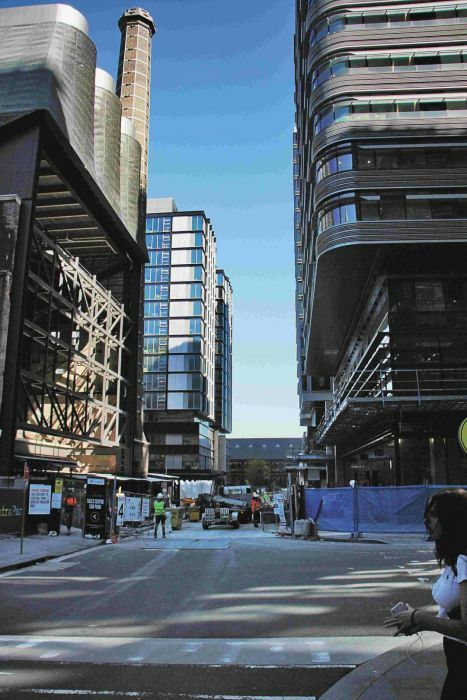 More and more of Chippendale’s buildings are being bought and redeveloped by the three surrounding universities. Chippendale Green has drawn the ire of long-term residents for attracting groups of partying youth. The suburb is transforming again, and the young, the old, the artists and the developers are competing to define the next chapter in Chippendale’s history.